Thursday night/May 31st the Woodstock Permaculture meeting at the library was a learning curve, for me, as always….I hope that this will be my first post!! Keiko I would love to have some of the transplants you have posted. I also have many extra plants that need thinning. Some of the many are: arugula savaticca (sp?) ( an intense variety that reseeds profusely, red bee balm, lily of the valley, Russian mustard, renegade garlic (escapees), several varieties of mints, red raspberries: Prelude and Caroline…that’s a start. 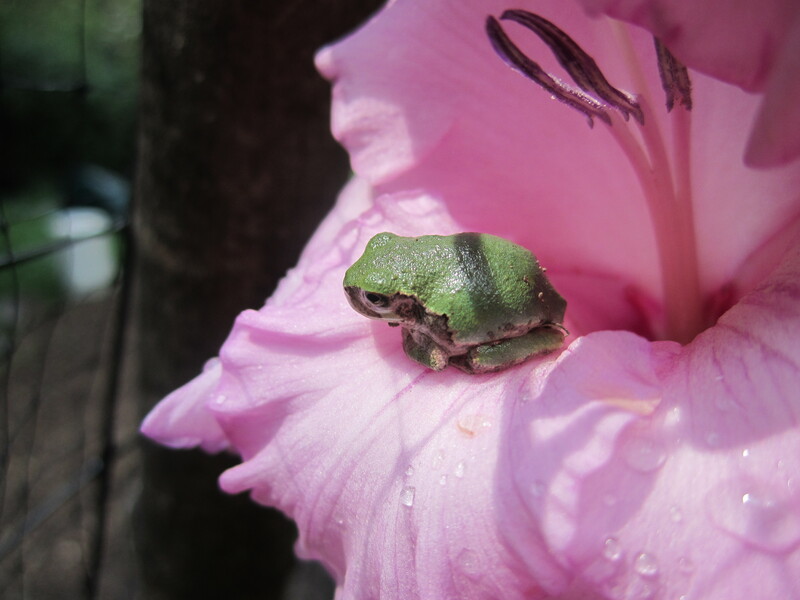 Here’s a garden assistant who frequented my home garden last summer…quite cozy in a gladiola blossom….I forgot choose pic placement. You can come by anytime after mid June after my perennials have finished blooming, then I’ll cut them down and divide them for you.